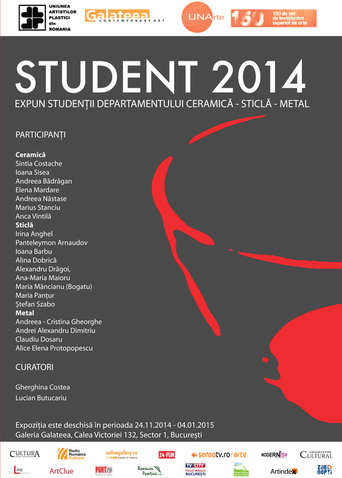 At Galateea, 2014 concludes with the exhibition of the students attending the National University of Arts in Bucharest, Dept. 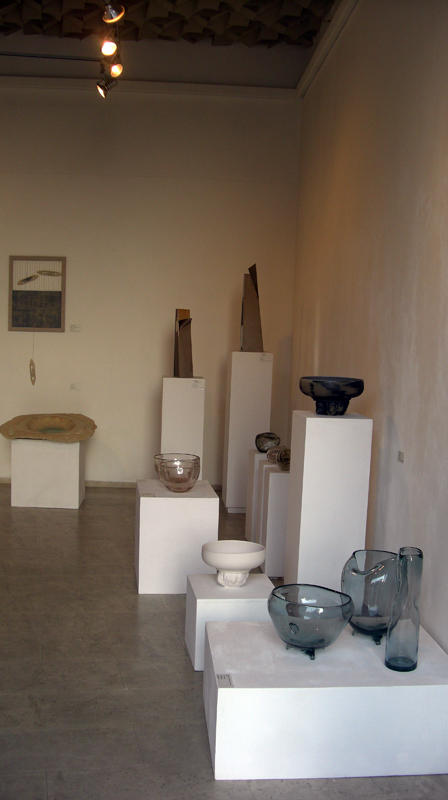 of Ceramics-Glass-Metal. 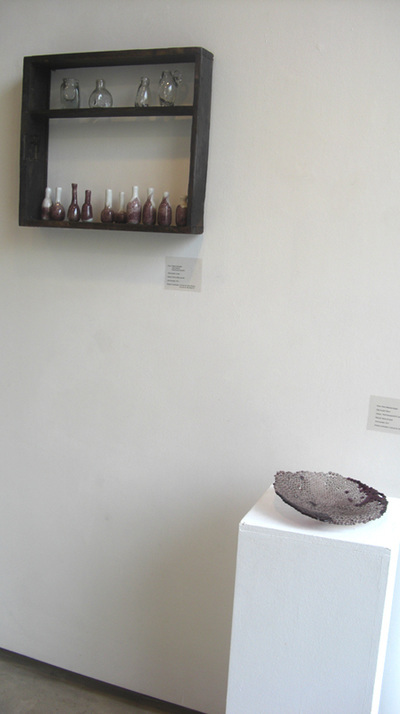 The event is quoted among the manifestations occasioned by the 150th anniversary of Romanian artistic higher education and inaugurates University’s cooperation with the Gallery. 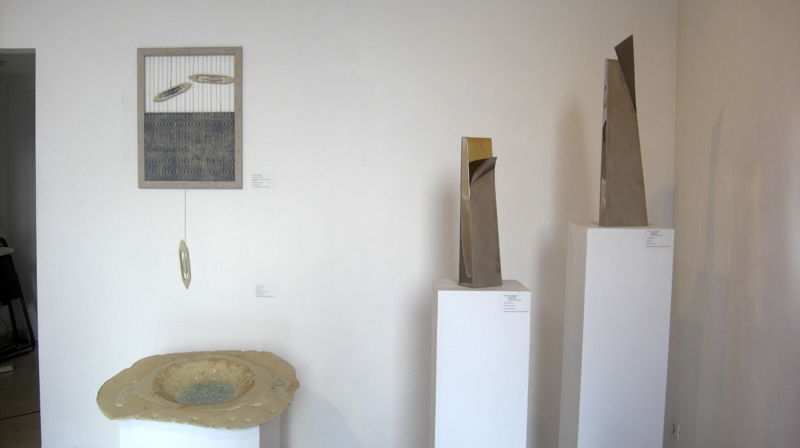 The exhibition is an opportunity to present, evaluate and promote the new talents tutored by Dr. Ovidiu Ionescu (lecturer), Dr. Ilie Rusu (assist. prof.), Dr. Ionel Cojocariu (lecturer), Dr. Liana Svințiu (lecturer), Dr. Lucian Butucariu (assist. prof.), Dr. Silviu Dancea (assist. prof.), Dr. Dan Popovici (lecturer), David Leonid Olteanu (assist., Ph.D.c. ), Ioana Stelea (assist., Ph.D.c. ), Dr. Bogdan Hojbotă (assist. prof.), Dr. Adrian Petrică (assist. prof.) and Ionuț Marin (assist., Ph.D.c.). Curators: Gherghina Costea, Lucian Butucariu. 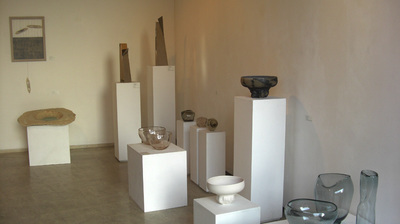 The exhibition is unique due to the diversity of materials – ceramics, glass, metal –, and the displayed objects – spheres, calottes, bowls and rectangles – occupy the whole space of the Gallery. 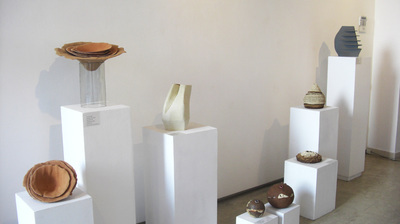 Starting from the vessel – as a shape containing ideas, customs, moods, stories and thoughts –, the young artists explore glass’ transparency, terracotta’s rugosity, stainless steel’s, copper’s and brass’ robustness. They get vessels by moulding the tactile sensibilities, the organic tomes and the Tiutin-like spheres.